Earlier this week, I was about halfway through reading a novel, one of those buzzy summer books promoted as an elevated beach read, when I realized I was simply…bored. Surely something was wrong with me: the book has been talked about everywhere from New York Magazine to NPR, all my trusted sources. The author is a charming literary darling, and though most reviews of the book said it had a generic plot, the author had made up for it with characters and humor. The plot was generic and I found most of the characters cloying, especially the mother, the classic nag of a wife (side note: can there ever be a story where a middle aged woman is a.) happy b.) not the victim of a cheating husband?). As I made the conscious decision to close the book and move on to something else, I felt a small sense of guilt. How come so many others loved this book? Should I stick it out and keep reading? I think I can still count on my fingers how many books I haven’t finished. As a literature apologist, I feel a particular sense of failure when I “give up” on a book. I’m of the wise old age of 27 now, and I realize (much like pretending to be friends with people you don’t like because you worry about not having enough friends), I don’t have time to commit to something I know I don’t like. Halfway through a novel, you should know whether or not you like it. Short story lovers exist in a novel world. Ask most people what their favorite book is, and they’ll likely name a novel. If they mention a short story collection, they’ll be sure to add a disclaimer that it’s not a novel. My friend finished St. Lucy’s Home for Girls Raised by Wolves and passed the collection along to me. 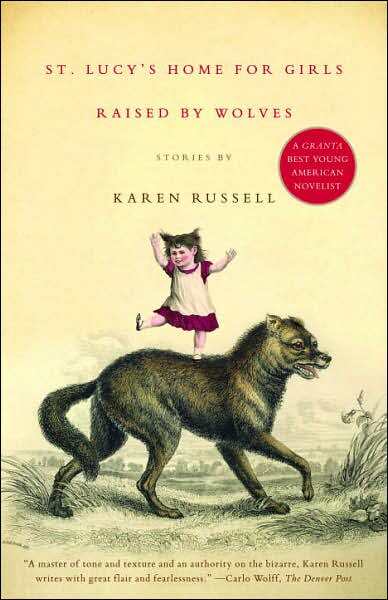 Written by Karen Russell, it came out before she was Swamplandia big, Pultizer Prize nominated big. I read the first story, “Ava Wrestles the Alligator,” which is the seed that sprouted Swamplandia. I think I like it more than the novel that expanded it. There is still the precocious young protagonist, her sister who may or may not be possessed by a ghost, and the absentee father who has left his children to fend for themselves at their rundown family gator park. What the short story does that the book does not is leave a shroud of mystery around the story. In the condensed version, the young girl’s interaction with the mysterious wanderer seems more sinister because of how little is described of the suspected attack. The story works better for me because it is cryptic in what the plot leaves out and what it replaces it with–metaphor-rich atmosphere. The story feels spookier because of what the reader is left to imagine. This is where I feel the short story thrives. Everyone uses the phrase “economy of language,” or saying a lot with a little. For me, the interesting accomplishment of the short story is choosing just the right details and backstories. “The Bird Man has ruined the dawn; his clammy touch feels like getting out of a bath and putting your filthy clothes back on.” With this one sentence to describe the attacker, the reader knows everything we need to about the man with whom the young girl talks. Think of “Where Are You Going, Where Have You Been?” by Joyce Carol Oates. The story ends with the innocent young girl being lured and pressured into joining the predatory older man. The reader never finds out what he does, though we suspect it will be terrifying. That ending, much like the ending of Raymond Carver’s “Tell the Women We’re Going,” sticks with readers because it leaves us without an answer, a resolution. My friend and I discussed “Ava Wrestles the Alligator” becoming Swamplandia. He asked me what short story of mine would I want to turn into a novel. I didn’t have an answer because I can’t think of my stories becoming something bigger, without worrying they would bloat into something out of my hands. Short story writers choose the length of their story for a reason. I like to tell about moments; if I stretch and stuff my stories, they would become a distorted version of themselves. There is a place for the sprawling, 600-page novel, but there is also a place for a the compact, 10-page short story. Neither one is better than the other, and I’m thankful for the opportunity to choose between both. My stories don’t have endings. They stop and then take squat in the minds of the readers who (hopefully) wonder and then decide how the characters move on from the snap shot they’ve been given. Well, that is the aim at least!!!! Short stories that give the reader the power to create the future plots and development of the characters are exciting and inclusive and bring a staying power that those which tell us what happens to our heros and antagonists don’t. Thanks for the thoughtful response. I like the idea you mentioned of the reader carrying on the story. It makes the writing process more collaborative, which is an intriguing concept considering how lonely it can sometimes feel to be a writer. Having readers dream up what happens to the characters feels like having the reader talk back to you, like writing is one big conversation. Yep. A conversation that transcends time, place and the humdrum of every day existence, although that is where the most indepth stories often lie – funny that!